It’s early. Ally has packed up her munchkins and headed off to work. Today I don’t have to be in to my day job until 10am, although I usually go in early because I love my job and the folks there. But this morning I have some sketching to do for a spell. We are between chapters for the next week on God Child, so I use the time to try to learn something new, whether it’s a photoshop setting or feature, or brushing up on the actual craft of drawing. Like most comic artists I’ve had a lot of aspiring creators ask me “What tools do you use?” so I thought I’d share a photo of my desktop (while it’s clear of clutter!) and what I’m currently using. Moleskine sketchbook, for gathering thoughts and sketching. It’s almost the only “tradional” drawing on paper that I do these days. iMac 27″: My main computer and workhorse. This model has been highly reliable since 2009 when I switched from PC. No more viruses or junk gumming up things! Microsoft Surface Pro+bluetooth keyboard: Primarily used as a digital sketchbook. I really love this little thing. I also have it synced up with creative cloud so I can ink on the couch or on the move. Prismacolor Markers: Ye’ old PrismaColor sets. 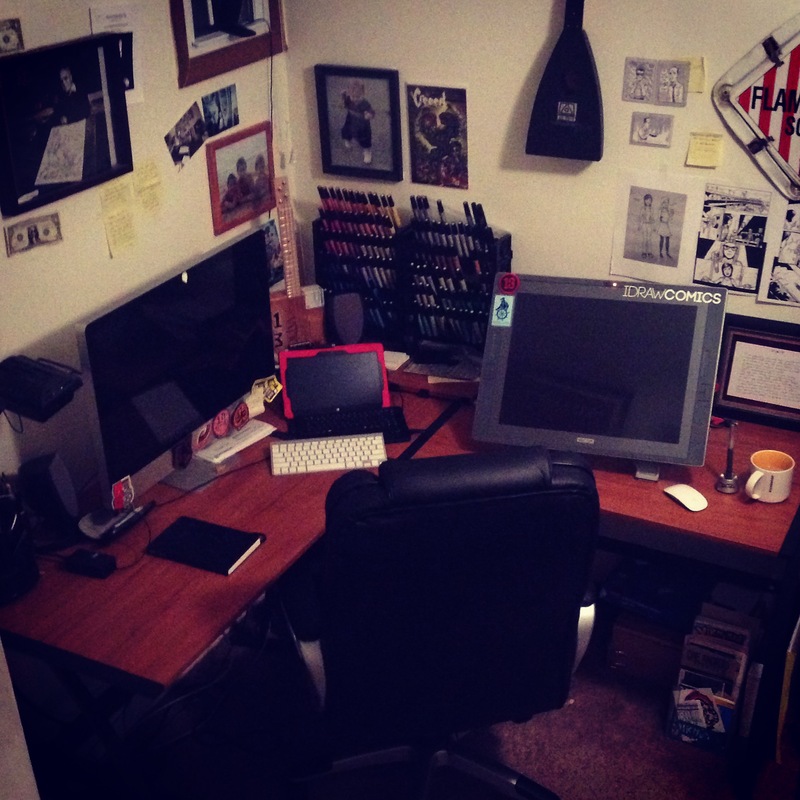 I don’t use them much, but they make artist’s desks look like and artist must work there. Lol. Seriously though, they are still my favorite for coloring commissions and art cards. Cintiq 21UX: This has been my main drawing tool since 2006. A true workhorse. Almost all of Hero By Night was drawn on it as well as all of the new God Child work. I have the newer model at work now which is very nice, but I still prefer this old bastich. We’ve been through a lot together. Programs I use: Primarily Photoshop with lots of layers and custom brushes I’ve made or collected specifically for comics. I also recently started messing with Sketchbook Pro and I love the perspective ruler drawing tool in that. Totally handy! I wish Photoshop would include a tool like that in a future update. I also utilize Adobe Creative Cloud a great deal. It allows me to have access to a comic page on all my devices. For example, sketch a bit on the Surface remotely, then finish up the page on the Cintiq later. The files automagically sync from the cloud. Adorning the walls and other areas around my space is a mashup of everything from photos of my kids (who I miss, especially when they were those ages), Jack Kirby, random post-it notes with quotes and possible dialogue, some copies of pages for reference, a signed copy of the Creech by Greg Capullo which I just found and slapped up there last night, Flammable Solid sign and my favorite sonnet written to me from Ally on Valentine’s day. Tucked under the desk in the shadows to the bottom right is a mini comic rack that still holds some of my favorite first works and minis from my old friends like Jim Rugg. (Connellsville kids represent!) Basically I surround myself with things and memories that inspire me. There you go, a little look into my world this morning before coffee.